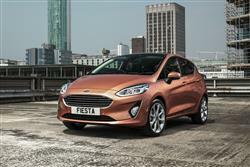 The seventh generation Ford Fiesta is at its most appealing in three cylinder 1.0 EcoBoost petrol form. Jonathan Crouch takes a look. Ford's latest Fiesta is a useful development over what went before. What hasn't changed is the 1.0-litre EcoBoost turbo petrol unit that most buyers will probably want. That's a good thing. Ford knows what it's doing when it comes to developing small cars for a demanding clientele and the seventh generation Fiesta is no exception. This car is effectively a far-reaching re-development of the previous sixth generation design and, as with that model, one of the strongest weapons this one has is its 1.0-litre three cylinder EcoBoost petrol engine. Since we first saw this unit back in 2012, virtually every other rival has developed its own downsized three cylinder 1.0 or 1.2-litre petrol turbo engine to try and compete. This Ford powerplant still feels a cut above most of them though. Certain realities exist in the supermini market. The additional cost of diesel engines rarely makes them big sellers, so this is where the state of the art in petrol engines is often played out. For some years now, Ford's 1.0-litre Ecoboost three-cylinder unit has been in the box seat in this regard. It's now available in a top 140PS variant as well as the usual 100 and 125PS guises. Either way, it's pretty vivid. In 100PS form, 62mph from rest takes 10.5s en route to 113mph. In the 125PS model, those figures improve to 9.9s and 121mph, while with the 140PS derivative, you're looking at 9s and 125mph. The Fiesta has long been one of the very best superminis to drive. This new generation model is 15% stiffer than before and both front and rear track measurements are wider. The engineers tell us that the chassis now offers 10% more cornering grip, supported by Electronic Torque Vectoring Control, which enhances the driving experience by applying a small amount of braking to inside wheels to assist traction and stability when cornering. Braking distances at 62mph are reduced by more than 8%. There are freshly developed five and six-speed manual gearboxes. And rear disc brakes feature on models with engines developing more than 100PS. You'll need to be budgeting the best part of £15,000 for a Fiesta with the 1.0-litre EcoBoost petrol engine we've been looking at here - list price-wise anyway. As usual, there's a £650 premium to pay if you want the extra flexibility of five doors. With this engine, you have to buy in at the 'Zetec' level of trim and at this point in the line-up, this powerplant only comes in its base 100PS form. If you can stretch to plusher 'Titanium' spec, then your dealer will offer you the option of a 125PS version of this unit. And this unit comes in a further 140PS state of tune if you can go further and get one of the sporty 'ST-Line' models. There's also a Fiesta 'Active' variant that offers SUV styling cues that target the growing Crossover market. Whatever your choice, you'll be offered some up-scale equipment options, examples including an openable panoramic glass roof. There's sophisticated safety too, including a Pedestrian Detection system that can even prevent collisions at night. And 'Active Park Assist' with brake interventions to prevent low-speed collisions when parking hands-free. As for standard equipment, even base models get features like air conditioning, Bluetooth, an 'Emergency Assistance' system and a 6-speaker stereo. The Fiesta has always been a bit of a star where running costs are concerned. When the engines used to be a bit off the pace, the asking prices were low. Now that the Fiesta has some of the most fuel efficient engines in the sector, the list prices of the cars are a little higher - but to compensate, residual values have improved a little in turn. The 1.0-litre EcoBoost engine returns some excellent figures with both 100 and 125PS variants returning a stellar 65.7mpg on the combined cycle and registering either 97 or 98g/km. With the 140PS model, the figures are 62.8mpg and 102g/km. Insurance premiums and maintenance costs have been kept low by an intelligent approach to manufacturing. Bake-hardened steel on the front wings, for example, offers better resistance to low speed bumps and scrapes. Headlamps and tail lamps are positioned high, away from potential impacts, while specially shaped 'crash cans' are designed as sacrificial parts, collapsing predictably in an impact to prevent more extensive damage and higher repair bills. The Ford Fiesta has always been a vehicle that the British public has warmed to and it makes most sense in this 1.0 EcoBoost guise. There's an unpretentious quality to this seventh generation model and a focus on providing the things that really matter to small car buyers - fun handling, an affordable asking price, low running costs and decent accommodation and space. With this MK7 design, to that little list, you can add strong safety provision and sophisticated media connectivity as well. The latest car has a polish and self belief that we've never seen from the Fiesta before. In short, this blue collar car has made good. Especially with three cylinder EcoBoost power.